Healthy glowing skin is a definite prerequisite for beauty. Eating right is very important to feed your skin the vital nutrients it needs to stay soft, supple, radiant and blemish-free. Every one wishes to remain youthful forever with fresh and radiant skin. Good nutrition can lower the pace of skin aging. So eat your way for glowing, blemish-free, soft and supple skin. Vitamin C: The basic sources of vitamin C are oranges, kiwi fruits, blackcurrants, strawberries, guava, papaya, blueberries, broccoli, red, yellow and green capsicum, lemons, limes and tomatoes. This nutrient is essential for skin because it helps produce collagen that strengthens the capillaries that are the passageways to feed the skin. You get vitamin C or ascorbic acid each day from what you eat and drink. Cutting and heating foods changes vitamin C and makes it less effective. So try eat these veggies and fruits raw or lightly cooked, and do not cut them too long before eating them. 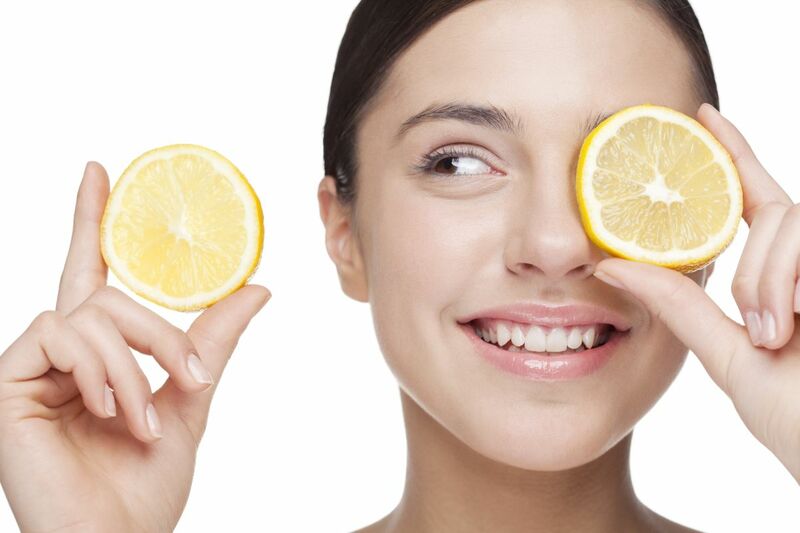 Vitamin C deficiency can lead to unhealthy skin. The antioxidant properties of vitamin C and its role in collagen synthesis make vitamin C a vital molecule for skin health. Vitamin E: Vitamin E is a powerful antioxidant that may be effective at reducing UV damage in skin. It can treat a variety of skin conditions like acne, psoriasis and the aging effects from sun exposure, sunburns and dark spots. It is readily available in many healthy foods, such as, salmon and other seafood, broccoli, spinach, and other green vegetables, nuts, seeds, vegetable oils including sunflower, wheat germ and safflower oil. Vitamin E can be absorbed even better when combined with vitamin C.
Beta carotene: Our body converts beta carotene in to vitamin A. we need vitamin A for a healthy skin as it helps to protect cells from damage. A lack in vitamin A can cause scaly, dry skin and trigger various other skin problems. Vitamin A is important for creation and repair of skin cells. It also helps fight inflammation due to certain skin tissues. The highest food sources of beta carotene are carrots, squash, romaine lettuce, red and yellow peppers, apricots, cantaloupe, sweet potatoes, dark leafy greens, such as kale and spinach. Taking beta carotene in adequate amount may reduce sun sensitivity, prevent skin damage and contribute to maintenance of skin health and appearance. This is due to its antioxidant properties. Healthy fats: Omega-3 Fatty Acids and Omega-6 Fatty Acids are building blocks of cell membranes and they prevent skin dryness to maintain healthy and hydrated skin. Omega-3 Fatty Acids nourish the skin and provide it with radiance and softness. Avoid eating unhealthy fats. Replace them with healthy fat sources in moderate amounts. In order to lose weight, sometimes you may reduce your healthy fat intake drastically. It can affect your skin badly. So make sure that your diet always contain healthy fat options. Healthy fats are found in avocados, oily fish, nuts and seeds. The monounsaturated and polyunsaturated fats in these foods act as a natural moisturiser for your skin and keep it hydrated. The outcome is soft, supple and elastic skin. Zinc: Zinc is an essential mineral that can help maintain the health of your largest organ, your skin. Due to its anti-inflammatory effects, it is helpful in healing skin lesions, like in the treatment of acne, psoriasis and dermatitis. We get most of our zinc from high-protein foods, such as meat, fish and nuts. Vegetarians may need an extra boost, but they can also find zinc in beans, mushrooms and spinach. Zinc helps heal and rejuvenate skin. It can ward off acne flare-ups. It helps new cells production and in the functioning of cell membranes. It is a key part of your skin’s dietary defence squad. Oysters, crabs and lobsters are a few top sources of zinc, but chicken, shellfish, nuts, dairy products, eggs, whole grains, seeds, beans, legumes and fortified cereals can also help meet your daily requirement of zinc. Selenium: Brazil nuts, yellow fin tuna, turkey, chicken, bananas, cashews, lentils, milk, yogurt, spinach, oatmeal, mushroom, sunflower seeds, brown rice, eggs, cottage cheese are loaded with selenium. Selenium neutralises free radicals and other skin-damaging compounds before they can lead to wrinkles. It safeguards cell membranes, the protective coating around the cells and slows down the signs of aging. It helps fight skin infection and relieve inflammation soothing the skin. The answer to retaining a healthy, glowing and youthful skin lies quite literally in your hands. The healthier your food options, the more radiant and lovely your skin can be. Switch to foods loaded with these nutrients for finer skin. While too little of these nutrients can cause serious skin issues, too much can also be harmful.